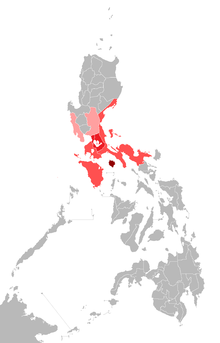 Predominantly Tagalog-speaking regions in the Philippines. The color-schemes represent the 4 dialect zones of the language: Northern, Central, Southern, and ماریندوک The majority of residents in کامارینز شمالی and کامارینز جنوبی speak Bikol as their first language but these provinces nonetheless have significant Tagalog minorities. In addition, Tagalog is used as a دوسری زبان across the Philippines.